Irish Landscape Artist, Sketcher, Illustrator. Biography, Paintings. The landscape painter, sketcher and illustrator William French was born in County Roscommon. Quite apart from his artistic talent in drawing and watercolour painting, he was also a writer, banjo-player, opera composer, poet and one of Ireland's most popular songwriters and entertainers. Hence his reputation as a Renaissance man. French graduated from Trinity College Dublin as a civil engineer in 1881, joining the Board of Works in County Cavan as an Inspector of Drains. During this time he combined work with a prolific output of watercolours, one of which - "Where ever I go my heart turns back to the County Mayo" - was sold by Dublin art auctioneers Whytes for a record €44,000. In due course, his musical career took off and he travelled widely, painting constantly. He painted scenes from Canada, the USA and the West Indies, as well as Switzerland and England. A typical motif was his portrayal of light breaking through clouds onto a landscape, while sunsets were another regular subject for his landscape painting. French caught pneumonia during a series of concerts in Glasgow and died in January 1920, aged 65. Percy William French exhibited regularly with the Water Colour Society of Ireland (WCSI) and the Royal Hibernian Academy (RHA). He also exhibited in several galleries in London, including the New Dudley Gallery with Mildred Butler and Claud Hayes. In 1974, 1979 and 1982 exhibitions of his works were staged at the Oriel Gallery Dublin. 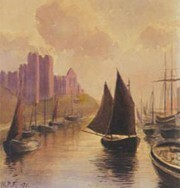 In 1983, the Percy French Society was founded whose collection at the North County Down Heritage Centre includes about 80 of his watercolours. The auction record for a work by Percy French was set in 2000, when his painting, entitled Paint Brush And Pen: Some Impressions, was sold at Christie's, in London, for £58,750.  For more about illustrators like Percy French, see: Irish Art Guide.  For more about visual arts, see: Homepage.